Music is a science. It is exact, specific, and it demands precise acoustics. A conductor's full score is a chart, a graph which indicates frequencies, intensities, volume changes, melody, and harmony all at once and with most exact control of time. Music is mathematical. It is rhythmically based on the subdivisions of time into fractions which must be done instantaneously, not worked out on paper. Music is a foreign language. Most of the terms are Italian, German, or French, and the notation is certainly not English &endash; but a highly developed kind of shorthand that uses symbols to represent ideas. The Semantics of music is the most complete and universal language. Music is history. Music usually reflects the environment and times of its creation, often even the country and/or racial feeling. Music is physical education. It requires coordination of fingers, hands, arms, legs, lip, cheek and facial muscles, in addition to extraordinary control of the diaphragmatic, back, stomach and chest muscles, which respond instantly to the sound the ear hears and the mind interprets. Music is all of these things, but most of all, music is art. It allows a human being to take all these dry, technically boring (but difficult) techniques and use them to create an emotional response. That is one thing science cannot duplicate: humanism, feeling, emotion, call it what you will. 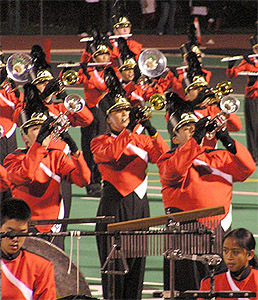 The purpose of the James Logan Band & Color Guard is to instruct students in the fine art of music performance, precision marching technique, musicality and team work. WBA Class 3A/4A Marching Band Champions, 2002, 2001, 2000, 1999, 1997. At the conclusion of marching season, the focus shifts to the numerous smaller ensembles within our band & color guard organization. Under the leadership of Director of Bands, Ramiro Barrera, the Logan instrumental music program has developed into one of the largest and finest in the state. We have eight primary instrumental music ensembles; Concert Band B, Concert Band A, an award winning Symphonic Band, a world class Wind Symphony, an award winning Percussion Ensemble and four Jazz Bands. All of these ensembles perform concerts and/or participate in various band and ensemble festivals throughout the state. The jazz bands perform locally at school and community events and out of town festivals. Typically, they participate at the Reno Jazz Festival in the springtime. 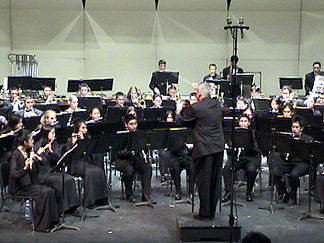 The performing bands participate in various concerts and festivals including the Western Band Association (WBA) National Concert Band Festival in Long Beach, California. In March of 2005, the Logan Band traveled to Edinburgh, Scotland, to participate in the Edinburgh Easter Festival Parade. This trip also featured performances of the Concert Bands, Symphonic Band, Wind Symphony and Percussion Ensemble. Wind Symphony & Symphonic Band - Top Honors WBA Concert Band Festival Fresno 2002. Wind Symphony - Top Honors Bands of America National Concert Band Festival, Indiana 2001. Percussion Ensemble has consistently placed in the top three at California competitions for the past 6 years. 2 of the 4 Jazz Bands performed at the Reno Jazz Festival and were in the top 5 for their level. Also, performed at the Santa Rosa Jazz Festival. Simply put, the Logan Color Guard program is the dominating force in color guard competition in the United States. Our Open Guard performers are the current 2006 California Color Guard Circuit (CCGC) Bronze Medalists, and gold medalists in 2002, 2003 and 2004. Our World Guard performers are the current 2006 WGI World Champions (Winter Guard International) and have been for an incredible nine years in a row! Open Guard and World Guard auditions are held during the field show season and students are placed into one of the two color guard units during November. Rehearsals begin during the Thanksgiving holiday week and winter vacations. The Open Guard and World Guard travel and compete in local, regional and national events including the Winter Guard International (WGI) West Regional, hosted by the James Logan Band and Color Guard Boosters. Open Guard: 2006 California Color Guard Circuit (CCGC) Bronze Medalists  2005 CCGC Silver Medalists  CCGC Champions - 2002, 2003, 2004. 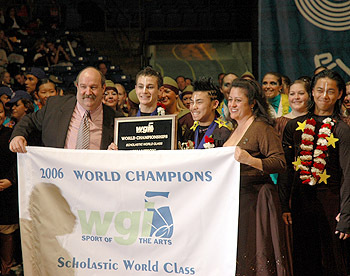 World Guard: 2006 WGI World Champions - also Champions 1998, 1999, 2000, 2001, 2002, 2003, 2004 & 2005. Ramiro Barrera is a graduate of San Jose State University where he received his BA in Music and his Teaching Credential. Mr. Barrera currently is celebrating his 29th year of teaching. This is his 8th year as Director of Bands at James Logan High School where he conducts the Wind Symphony. Prior to Logan High School Mr. Barrera taught for the San Jose Unified School District & the Clovis Unified School District where his bands gained national recognition as outstanding Marching, Concert & Jazz programs. Throughout his teaching career he has had much success with his Marching, Concert & Jazz Programs. The James Logan Marching Band is a West Coast. leader in the marching band activity. The group has performed in the Macy's Thanksgiving Day Parade, the Pasadena Tournament of Roses Parade & has won 7 Western Band Association Marching Band Championships. The Logan Wind Symphony has performed at the prestigious Midwest Band & Orchestra Clinic held in Chicago December 2003 and at The Bands Of America National Concert Band Festival April 2001 in Indianapolis. March 2005 the Concert Bands traveled to Scotland to perform at the Edinburgh Easter International Music Festival. His professional affiliations include California Band Directors Association, California Music Educators Association, American String Teachers Association, California Orchestra Directors Association & The International Association of Jazz Educators. Mr. Barrera is past President of The Western Band Association. Ken Karlin holds a degree in music from Ball State University in Muncie, Indiana, where he studied saxophone with George Wolfe, jazz with Larry McWilliams, and played under the baton of Dr. Joe Scagnoli. He also attended the Indiana University School of Music in 1985-86, studying saxophone with Frank Bongiorno, jazz with David Baker, and playing under the baton of Dr. Steven Pratt. In the summer of 1986 he performed with Dave Barduhn's Jazz Abroad Big Band during a European tour. 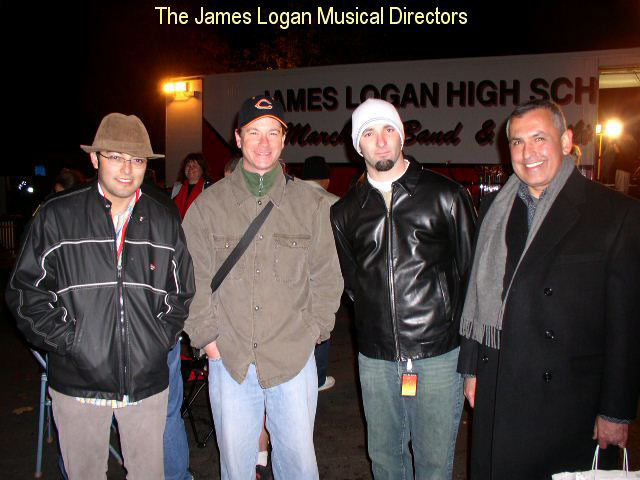 Mr. Karlin has been associate director of bands at James Logan High School since 1999. His responsibilities include conducting the symphonic band, jazz ensemble "A" as well as coordinating the jazz program and marching band. Anthony Lanzino is a 1997 graduate of San Jose State University School of Music and is currently in his 5th year of teaching at James Logan High School. His responsibilities include the Concert Band, Jazz Ensemble "B" and the String Orchestra. Mr. Lanzino is also a freelance musician playing the trombone and bass guitar. He performs and records regularly throughout the San Francisco Bay Area.